The Peranakans are Malacca Straits born Chinese and local Malays. The term Baba refers to men and Nyonya refers to women. This sub-ethnic group created a fusion of cultures, which is rich in history and unique to Malaysia. Brides wore special wedding shoes like the one above. The intricately embroidered velvet and silk uppers with gold and silver wire. When finished, they were brought to a cobbler who then turned them into mules by lasting and adding a sole. 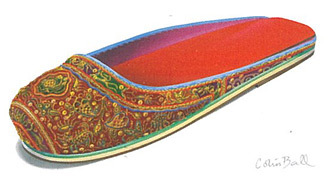 The style which had a stub toe, much like a modern day ballet shoe, became known with the northern Nyonya as 'the frog slipper' and as 'Kasut kodok' or 'bum-boat shoe' with the southern Straits Chinese.